How Biased Is the BCS towards the SEC? This year, 5 different college football teams finished the season with 1 loss (Alabama, Florida, Oregon, Kansas State, and Northern Illinois). Only one of these teams could be ranked second in the BCS and play for a national championship. The overwhelming consensus was that it should be the SEC champion, Alabama, and sure enough that's what happened. And on top of that, the team ranked third was Florida, another SEC team. There wasn't even a conversation about whether Oregon or Kansas State deserved to be ranked ahead of either SEC team. Instead, all of the talk was about how the 5th one-loss team, Northern Illinois, unfairly ousted Oklahoma from the BCS. It appears that there is bias in favor of SEC teams when it comes to the BCS rankings. But unlike many sports writers, the quality improvement world uses statistics to back up their claims. So I'm going to follow suit and do some data analysis on the BCS. 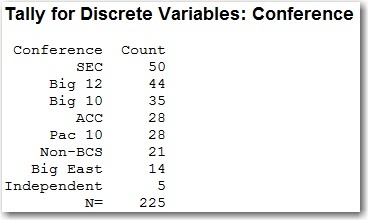 Is there really a bias towards the SEC? And if there is, is that bias warranted? I collected data on the top 15 teams in every BCS ranking since its existence. I also collected the conference the team came from, and the number of losses they had. You can get the data here. Let’s start by seeing which conference has had the most teams ranked in the top 15 of the BCS. We’ll use Minitab’s tally command to total everything up for us. In the 15 years since the BCS has existed, the SEC has the most teams ranked in the top 15, with 50. The Big 12 isn’t too far behind, with 44 teams. So when it comes to getting teams ranked in the BCS, the SEC and Big 12 are the top conferences. The next thing we’ll look at is how similar teams from different conferences are ranked. I’ll define “similar” as teams with the same number of losses. For example, say an SEC team and a Big 10 team both have 1 loss. Which conference has their team ranked higher on average? Let’s turn to Minitab Statistical Software to find out! 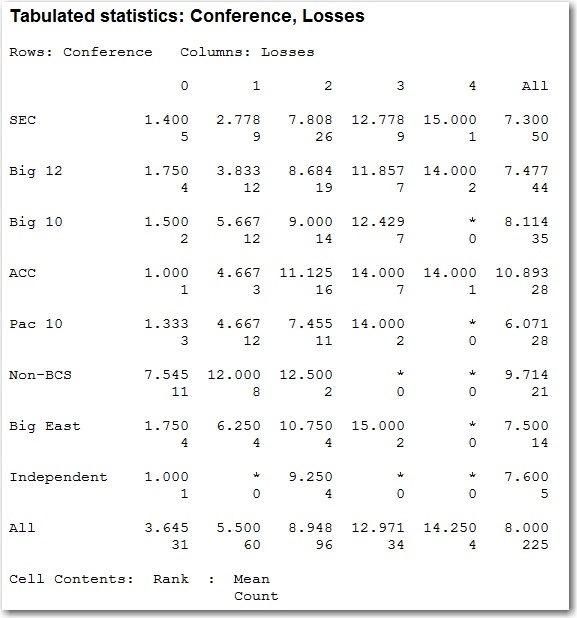 This table shows us the average rank of each conference for teams with the same number of losses. For example, look at the upper left hand corner (the cell under “0” and beside “SEC”). This tells us that when an SEC team has 0 loses, their average rank is 1.400. The “5” under the “1.400” tell us that there have been 5 SEC teams with 0 losses. So looking down first column, we see that when a team goes undefeated, they are almost always ranked in the top 2. The only teams getting ranked differently are the non-BCS schools, which is no surprise. When you move on to teams with 2 and 3 losses, things balance out a lot more, but it looks like there is definitely bias in favor of SEC teams with 1 loss. And in fact, there also seems to be bias in favor of 1-loss Big 12 teams too. Let’s look at one final thing, the BCS championship game. How often is each conference getting left out of the championship game? I'll define a team as getting left out if they have the same number of losses as either one of the teams participating in the BCS championship game. The table below shows when each conference is included—and left out of—the game. There have only been 4 SEC teams that have been left out of the championship game when they've had the same number of losses as a team in the title game. And for 3 of those 4 teams, the reason they were left out was because there already was a SEC team in the championship game. The only SEC team to get left out for two non-SEC teams was Auburn in 2004. The ACC appears to be getting a fair deal, as they have been left out of the championship game only 40% of the time. But their three appearances in the championship game were all by Florida State from 1998-2000. The ACC really hasn’t been close to a BCS title since, so their numbers are a little misleading. So really, the conference benefiting the most after the SEC is the Big 12. It’s been a common theme throughout this data analysis. The BCS definitely favors SEC teams, but Big 12 teams aren’t too far behind. And the poor Pac 10. They’ve been left out of the championship game 11 times. If there was ever a time to call East Coast bias, this might be it! And if you want ammunition for why college football needed a playoff, look at the bottom row. There have been 45 total teams that have been left out of the championship game. Even when you remove the non-BCS teams, there have still been 35 teams from BCS conferences that have been left out championship game. That’s more than 2 per year! It’s about time we determine who the better teams are on the field! But Is the Bias Warranted? We’ve definitely found evidence that the BCS favors SEC (and Big 12) teams over other conferences, but we haven’t said this is a bad thing. For example, a pudding manufacturer might have a process that makes more chocolate pudding than any other flavor. But if that’s the “best” flavor, and sells the most, then they should be making more chocolate pudding! Likewise, if the SEC is really the “best” conference, they should be ranked higher than the other conferences. 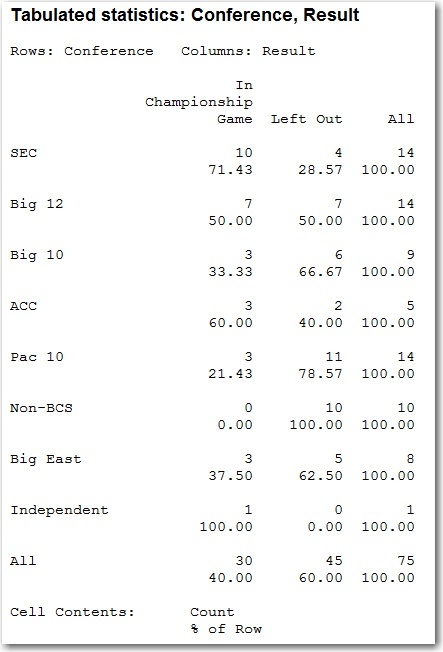 Let’s look at each conferences performance in BCS bowl games. If you thought this was going be an SEC-bashing article, you thought wrong. The SEC has a better record in BCS games than any other BCS conference. And things get even better for the SEC when you just look at just BCS title games. The SEC is 8-1, with the one loss coming when two SEC teams played against each other. No other BCS conference even has a winning record in BCS title games. So yes, the SEC gets ranked more favorably when it comes to the BCS rankings. But that is because they’ve earned it by winning time and time again in BCS games. Wait, we can complain about something with the BCS! Remember how the Big 12 was right behind the SEC in every category that we looked at? Well they have a measly 42% winning percentage in BCS games and are a lousy 2-5 in the title game. They haven’t earned anything, yet they continue to get ranked higher than the other conferences (minus the SEC). And remember how the Pac 10 has been left out of more championship games than any other conference? Well they are the only BCS conference other than the SEC to have a winning record in BCS games. Yet they’ve only played in three BCS championship games! If I’m voting in one of the polls that determine the BCS rankings, I’m ranking Pac 10 teams higher than the general consensus and Big 12 teams lower. So yes, the BCS favors SEC teams. I know many people are tired of hearing about that conference. But it’s hard to argue against it, considering how well SEC teams have done when they’ve played in BCS games. The real question should be why Big 12 teams continue to get looked upon favorably even after they continue to lose BCS games. Even this year, everybody has made a huge deal about Northern Illinois making a BCS bowl instead of Oklahoma. Part of why the Big 12 has such a poor performance in the BCS is because Oklahoma has lost 5 of their last 6 BCS games. Oh, and non-BCS teams have done pretty well in BCS games, too! So I'm not upset that a non-BCS school is getting a shot in a big game. After all, it’s about time we stop looking at a school's “name”—and start looking at the data!